Archaeologists from Bulgaria’s National Museum of History have started their 2015 excavations of the Late Antiquity Early Byzantine fortress Talaskara located on the Cape of Chervenka, also known as Chrisosotira, or “Golden Savior, Golden Christ”, near the Black Sea resort town of Chernomorets. The excavations of the Byzantine fortress on the small peninsula known as Cape Chervenka are the first Summer 2015 excavations for the archaeologists from the Museum, its Director Bozhidar Dimitrov has announced, as cited by the Bulgarian news agency Focus. Cape Chervenka is located 2 km northwest of the Black Sea resort town of Sozopol, and its peninsula resembles another small peninsula on the Bulgarian coast – that of Nessebar’s Old Town. Both of these peninsulas have narrow “necks" leading to wider capes. 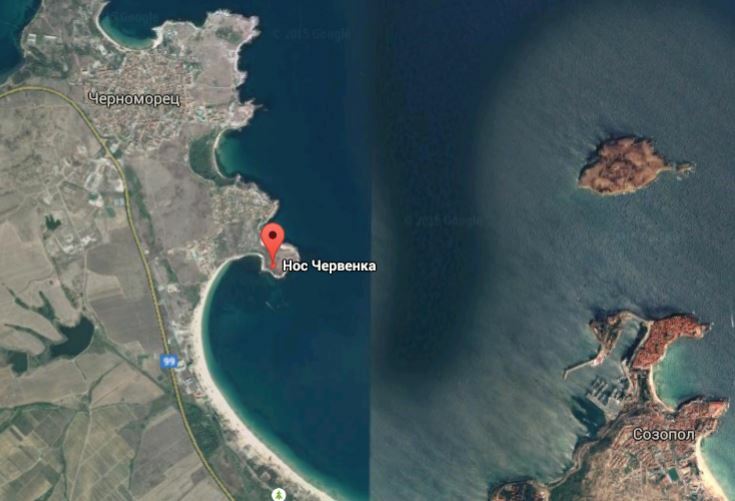 The Cape of Chervenka has an area of 68 decares, or approximately 17 acres, and until recently it could not be explored by archaeologists because it was the site of a military base of the Bulgarian Navy. “For a long time, the peninsula was a military base. The military vacated it several years ago, and the archaeological excavations became possible. Prior to that, members of the military had been telling the archaeologist that they had seen parts of ancient dwellings, fortress walls, etc," says Bozhidar Dimitrov. “The inspection and the drilling excavations from last year confirmed that the peninsula was surrounded with a strong fortress wall, with fortress towers every 30 meters, which would make this one of the largest fortified cities in Bulgaria from the Late Antiquity since the fortress wall is from the 6th century, and was built as part of the large-scale fortress construction at the time of Byzantine Emperor Justinian I the Great (r. 527-565 AD)," elaborates the head of Bulgaria’s National Museum of History. The Late Antiquity Byzantine fortress on Cape Chervenka near Bulgaria’s Chernomorets was first excavated with drilling probes in the summer of 2014 by a team led by archaeologist Assoc. Prof. Ivan Hristov, Deputy Director of the Bulgarian National Museum of History, with a special permit from Bulgaria’s Defense Ministry. A large fortress tower with dimensions 5 by 6 meters unearthed by Ivan Hristov’s team in 2014 is taken to indicate that the fortified Byzantine settlement located on Cape Chervenka was a rich city, whose name, however, remains unknown. The last time the fortress on Chervenka was used was during the Russian-Turkish War of 1828-1829 when the navy of the Russian Empire used it to set up a base where it accepted tens of thousands of Bulgarian refugees fleeing Ottoman Turkish atrocities who were then transported by sea to the region of Bessarabia (in today’s Moldova and Ukraine), and the Taurica (Crimean) Peninsula, and settled there. The Late Antiquity and Early Byzantine fortress Talaskara on Cape Chervenka, also known as Chrisosotira, or “Golden Savior, Golden Christ” is located on a small peninsula on the Bulgarian Black Sea coast near the resort town of Chernomorets, and 2 km northwest of the resort town of Sozopol. Not unlike the peninsula of the Old Town of Nessebar, another Black Sea resort town, Cape Chervenka has a narrow neck leading to a wider cape with an area of 68 decares (app. 17 acres), which was surrounded with a robust fortress wall with large fortress towers every 30 meters. The fortress wall of the Byzantine fortress Talaskara on Cape Chervenka (Chrisosotira) is from the 6th century, and was built as part of the large-scale fortress construction at the time of Byzantine Emperor Justinian I the Great (r. 527-565 AD). For a long time, Cape Chervenka was a military base of the Bulgarian Navy, and Bulgarian archaeologists gained access to it only in 2014 when a team led by archaeologist Assoc. Prof. Ivan Hristov, Deputy Director of the Bulgarian National Museum of History, conducted drilling excavations with a special permit from Bulgaria’s Defense Ministry. A large fortress tower with dimensions 5 by 6 meters unearthed by Ivan Hristov’s team in 2014 is taken to indicate that the fortified Byzantine settlement located on Cape Chervenka was a rich city. The last time the fortress on Chervenka was used was during the Russian-Turkish War of 1828-1829 when the navy of the Russian Empire used it to set up a base where it accepted tens of thousands of Bulgarian refugees fleeing Ottoman Turkish atrocities who were then transported by sea to the region of Bessarabia (in today’s Moldova and Ukraine), and the Taurica (Crimean) Peninsula, and settled there.